PHOENIX, AZ. — After the Seahawks crushing Super Bowl loss against the Patriots on Sunday, of course in retrospect, we all ask the same question, “Why didn’t they give the ball to Lynch?” But what if the pass would’ve succeeded? Like in so many of the Seahawks gutsy calls in past games, Peter Carroll, Russell Wilson and his strategists would have been called nothing short of brilliant … except on this one somber Super Bowl Sunday. 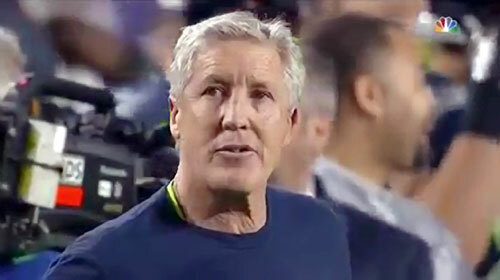 Seahawks coach, Pete Carroll, expresses disbelief after Patriots Malcolm Butler intercepts a goal line pick pass from Russell Wilson, clinching the Super Bowl XLIX win for the Patriots. Maybe I’m the only one who understood the reasoning behind Carroll’s controversial call. Let’s take a look. There were three plays left, but only one time out. The Patriots goal line stance were expecting Lynch to run the ball. Maybe they should have gone Beast Mode first, but if he didn’t make it, then they would’ve had to use their last time out, therefore Carroll and Wilson went for the pick pass, which would’ve stopped the clock if failed, thus giving Lynch now two chances to score on 3rd and 4th. It sounded like another brilliant strategy, right? WRONG! Patriots rookie cornerback Malcolm Butler had a vision he would make a big play. Photo shows Butler intercepting Russell Wilson at the goal line to win Super Bowl XLIV for the Patriots. 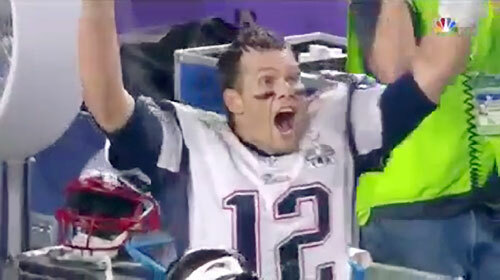 It looks like Tom Brady is having an out of body experience as he just realized his team clinched the Super Bowl XLIV title with rookie cornerback Malcolm Butler’s miracle goal line interception..
No one foresaw Patriots’ rookie cornerback Malcolm Butler’s goal line interception coming, taking away any chance for Marshawn Lynch to even attempt a touchdown. Butler, who said he had a vision, now became the miracle that the Patriots needed. We will never know now if Lynch could have made that last yard for the win. Watch Patriots rookie cornerback Malcolm Butler pick off Russell Wilson to win Super Bowl XLIX. Pete Carroll falls on his sword, taking responsibility for his controversial call. “Unfortunately, with the play that we tried to execute, the guy makes a great play and jumps in front of the route and makes an incredible play that nobody would ever think he could do. And unfortunately that changes the whole outcome…. unfortunately, the play goes the other way. There’s really nobody to blame but me, and I told them that clearly. And I don’t want them to think anything other than that. Isn’t the mantra of every broadcaster, critic or coach after any devastating loss “Shoulda Woulda Coulda,” I’m sure Carroll will have to live with this decision for a long time, but I don’t think he deserves the pounding he’s getting. It’s so easy to criticize that one offensive play that ended the Seahawks chances of winning a second Super Bowl. It was only deemed a controversial call though, because it didn’t succeed. All the controversial calls in past games that succeeded is why the Seahawks made it to the Super Bowl in the first place. Just ask Aaron Rodgers and the Packers. I think we can all agree that not knowing whether Marshawn Lynch could have won the game, is what hurts and stings the most. I have to admit I felt the pain of that loss more than any other game I’ve ever watched. The Seahawk players and fans are still trying to understand and reconcile what happened. Could there be a bigger purpose for the outcome? The day before the game, I told my son that God can use athletes by giving them the OPPORTUNITY on the world stage to glorify Him by acknowledging that they put Him first in their lives. Also, no matter the outcome, watch for Russell’s response to his 1.16M twitter followers. Who is the hero? M. Butler wore a cross necklace while being interviewed by Robin Roberts as he humbled himself to acknowledged his and his mother’s prayers. Pete Carroll used the word OPPORTUNITY and find the TRUTH during his interview with Matt Lauer.